Is there a way to include it? would be great because I would love to control my synthesis with OM for batch synthese. Hi — sorry I didn’t see this message. OM-SuperVP simply formats command lines for SuperVP, so that might not be too difficult to achieve. Can you look at the SuperVP command line in AudioSculpt and identify what is the difference with and without the checkbox checked ? yes, It should be just the -U. @bresson Jean, I’d like to make this a bit clearer for you - the question is whether you OM SuperVP sets the -U flag in the SuperVP command line. The -U flag is not a good idea because it adds an systematic fade-in to the sound which becomes a silence if the sound is stretched. The question would therfore be whether you have it in there or not. If not then the problem is not the -U flag, then the silence that mariarose observes comes from another problem, which might be a misplaced -B flag. -B with negative argument starts reading the sound before zero inserting effectivly some silence. 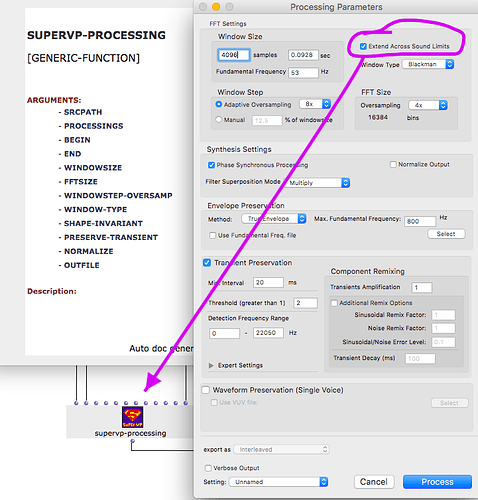 These are the two bsic means to insert silence with supervp. Yes, the -U flag is set by defaut. What do you think ? Shall I just remove it, or make it optional with a new argument to the OM function ? … in other words: in which case is this -U flag useful ? I would suggest a optional argument would be nice. And sorry folks, for the late reply. If the -U switch is removed it works ok for you. So here is the file to be replaced in the sources folder of OmSupervp library. I tested it with a white noise and it does what you need. Maybe should put like in the omcsound lib commandline preferences for the user. Sorry, for the slow reply, I don’t get any messages telling me about the reactions! Personally, I never use -U. But in case people want to force a fade in it could potentially be of use. Also, if people are used to have it and if now you switch it off, that will change results and might then be perceived as a problem. In this version supervp-processing has a new optional input allowing to check/uncheck this option (i.e. include or not the “-U” option to the SuperVP command line). As indicated the release does not include SuperVP binaries, so you should copy them manually from your current OM-SuperVP folder (resources/bin) or point to AudioSculpt Kernels from OM preferences.